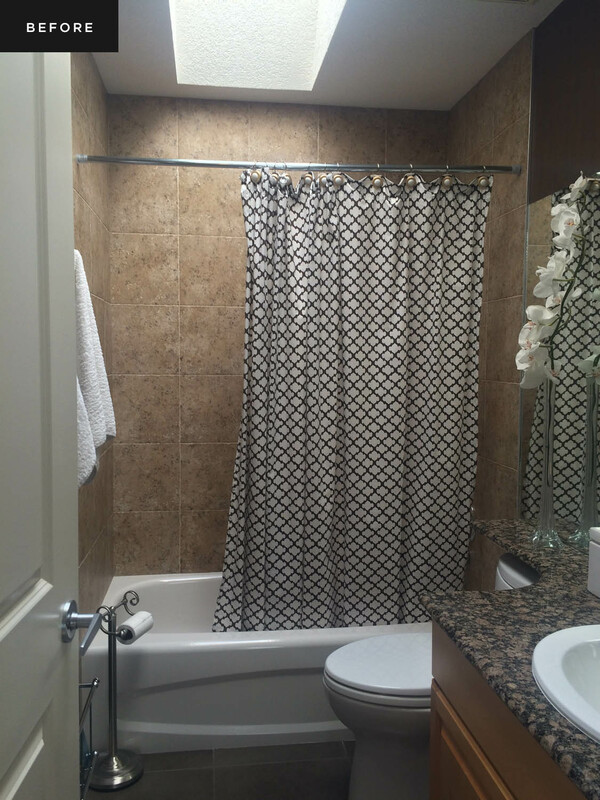 This second main bathroom of the Millers’ home needed a completely new look. 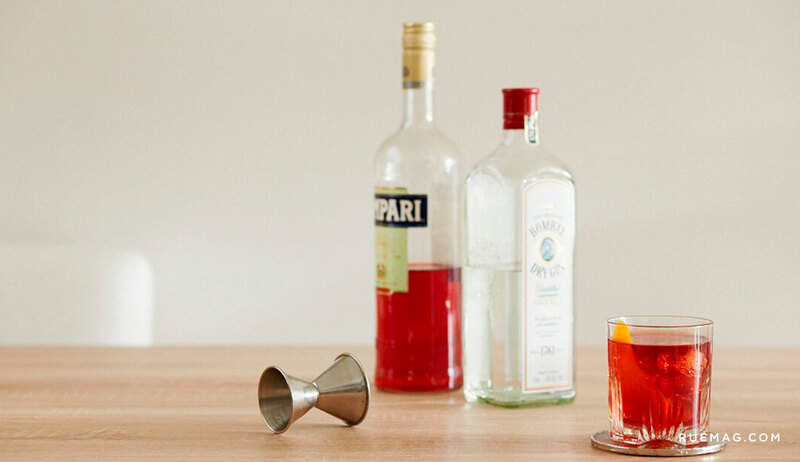 Since it was mainly used by guests, the focus here was purely aesthetic. 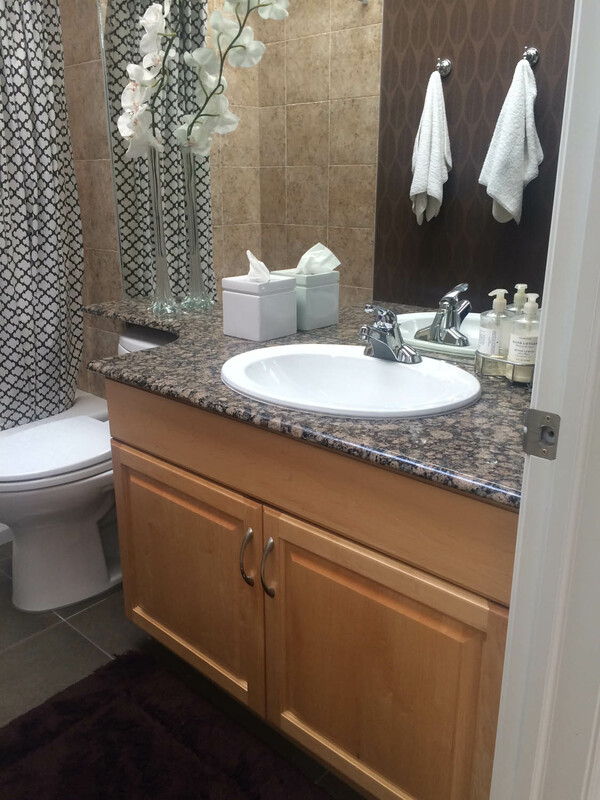 She decided that the floor tile would be kept which meant that the new bathroom vanity and wall tile needed to highlight the original floors. With a gorgeous skylight, the space was lucky enough to have natural light flooding in. Alanna’s first decision was to choose a walnut vanity cabinet that paired well with the neutral brown floors to create warmth. 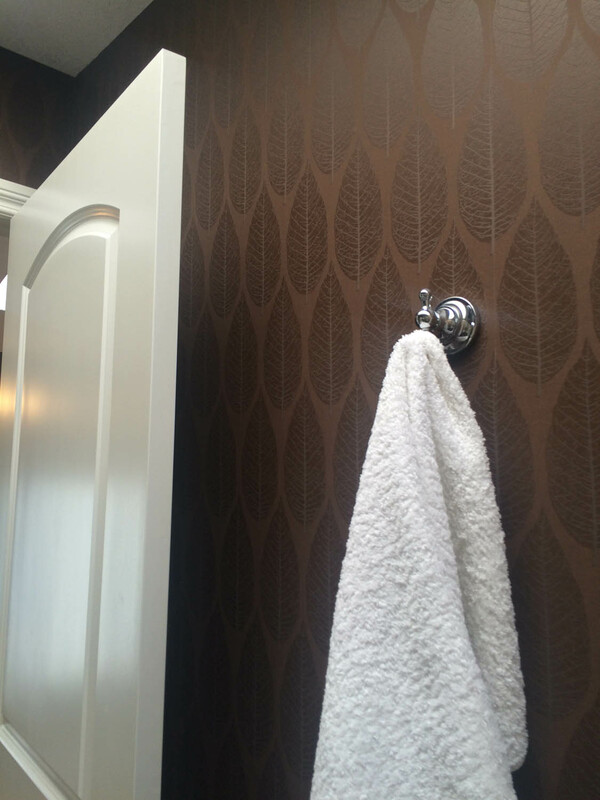 She changed the mirror above the vanity along with a strip of damask wall tile to create a focal point. To keep the costs down, she chose a simple wall tile for the shower but combined it with a black grout to create a graphic look. To give the feeling of a bigger and brighter space she smoothed out the walls and painted them a crisp white, as well as added a glass partition for the shower. 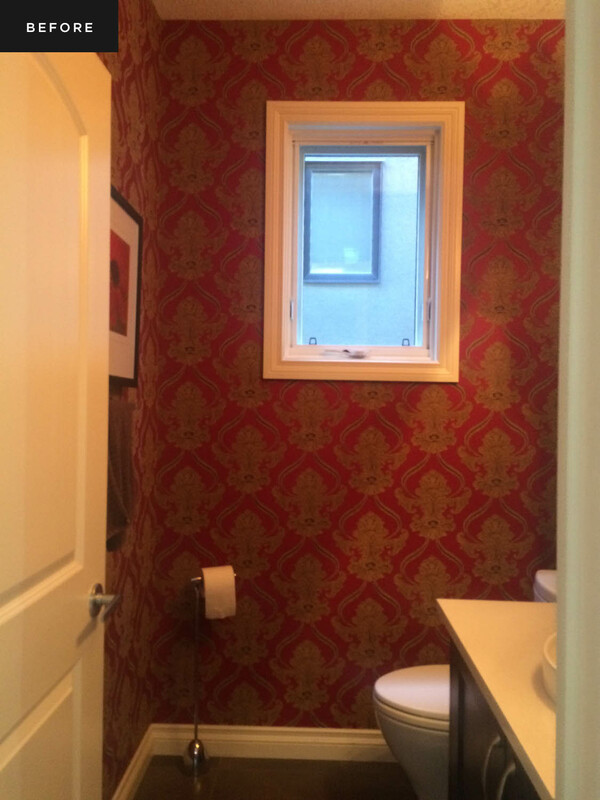 The first thing that had to go in their powder room was the maroon wallpaper that was making the whole room feel darker. 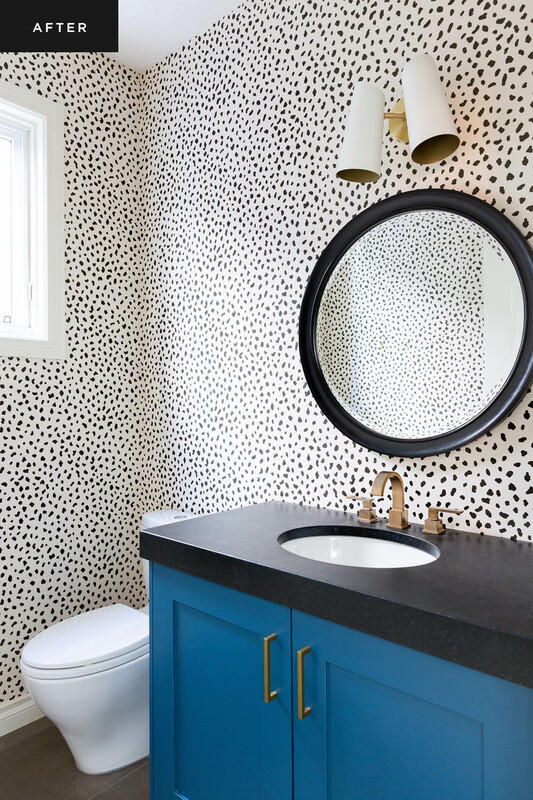 Since the original wallpaper had to go, Alanna chose a Dalmatian print option from Thibaut. They kept the original vanity but repainted it in a bold blue to create a statement piece in the space. Finally, the hardware and light fixtures were changed out for brass mid-century options to elevate the overall style. 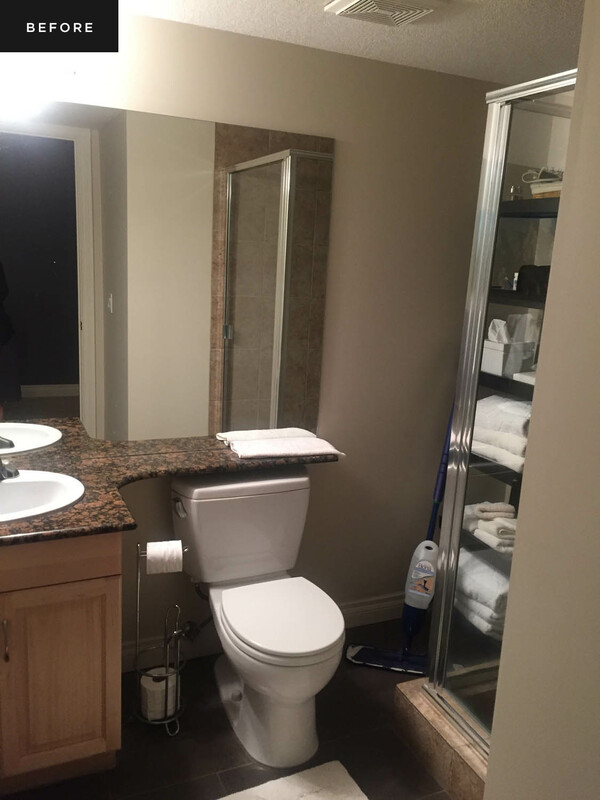 During the renovations, Lisa and Keith Miller began to use their basement bathroom, to soon find out that this room also needed a facelift. The shower was too small and the overall layout, poorly configured. 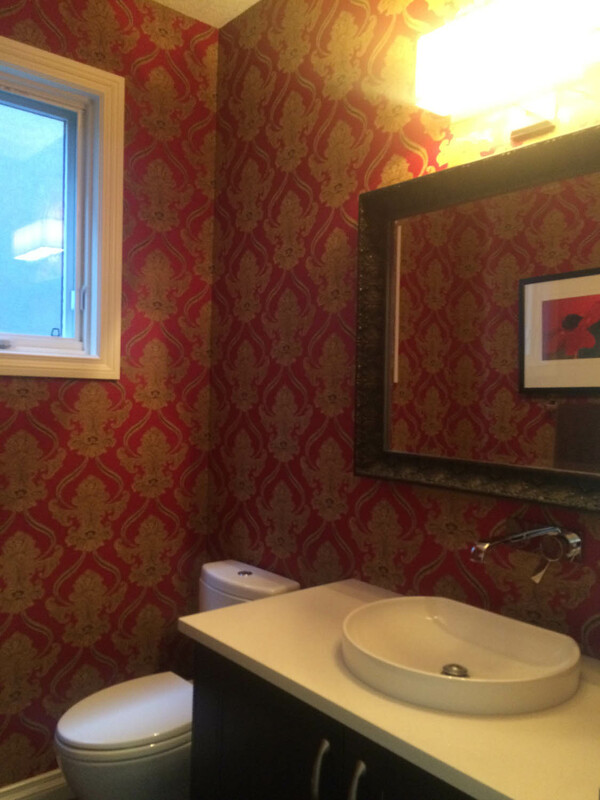 Not to mention, that their basement bathroom lacked the bright and airy feel of the rest of their home. 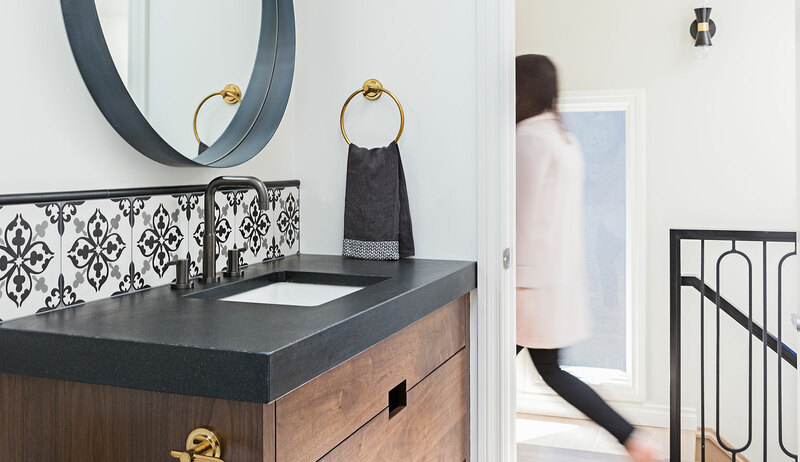 Similarly to their powder room, Alanna chose to keep this space’s floor tile and change up the rest. 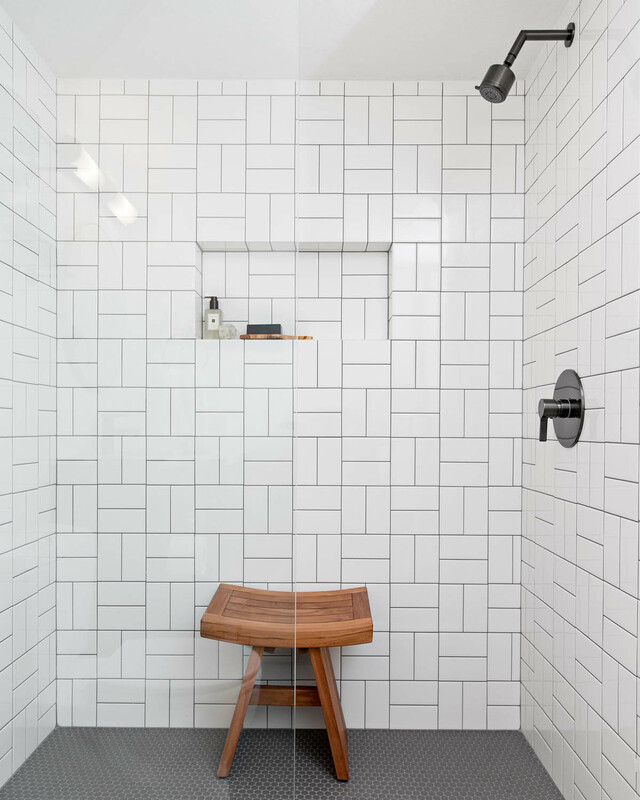 Alanna’s first task was to completely reconfigure the layout — with her eye, they were able to move pieces around to double the size of the shower. The new inexpensive wall tile was placed in a parquet fashion to give it a more elegant feel. 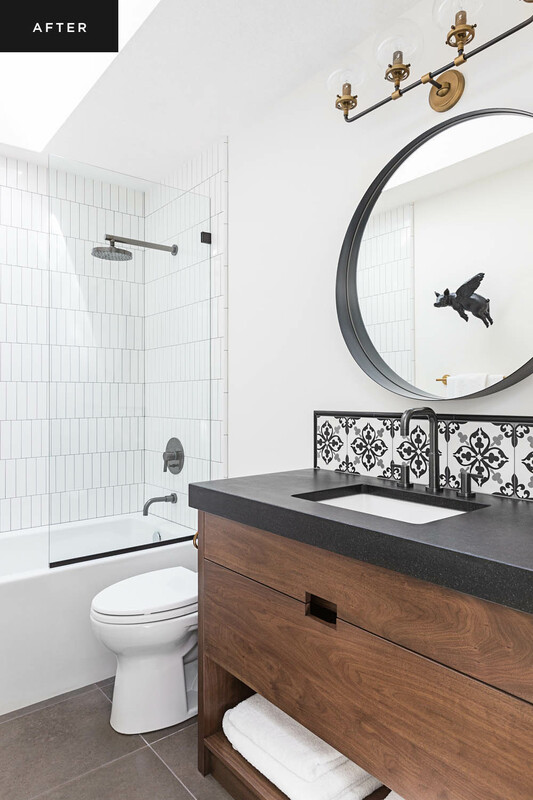 So as to not interrupt the tile pattern, Alanna decided to forgo a wall-mounted bench and opted for an individual teak option that can be moved around. 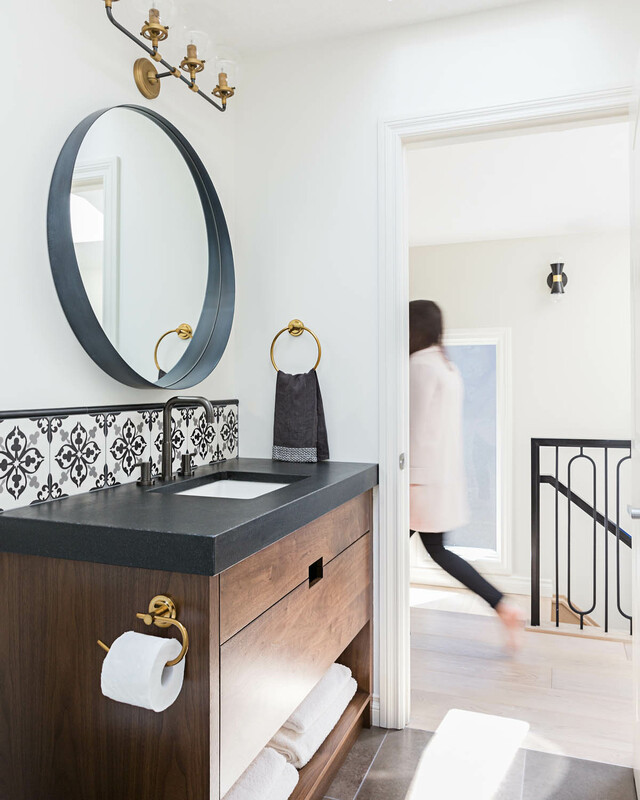 After Alanna Dunn of Reena Sotropa In House Design Group had already worked on Lisa and Keith Miller’s master bathroom with great results, the couple decided to hire her again to tackle their three other bathrooms in their home: a basement bathroom, a powder room, and a second-floor bathroom. Not believing in completely stripping the spaces, Alanna reused some of the components of each and added in other major pieces to create a bold and fresh look. Browse the slideshow to see some shocking before-and-afters! 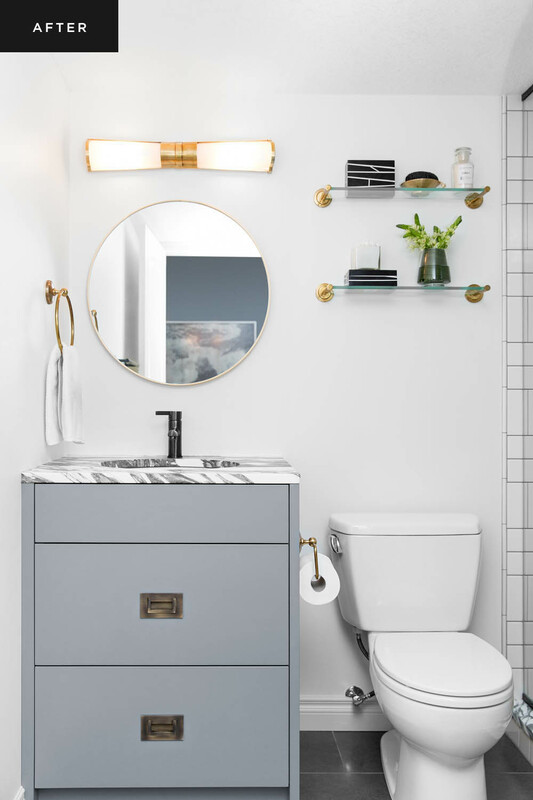 Can you please tell me the manufacturer of the grey vanity in the basement bathroom. Thank you! Where is the black framed mirror (second floor bathroom from? Thanks!